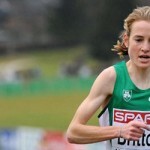 Fionnuala Britton (Kilcoole AC) put in a stellar performance of front running to take the gold medal at the 18th SPAR European Cross Country Championships in Velenje, Sloveni. This is Ireland’s second senior women’s gold medal in the history of these championships, with Catherina McKiernan winning the inaugural senior Women’s race in 1994. 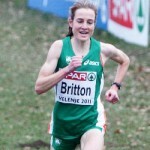 Britton was resolute throughout the race, setting a gruelling early pace. She led the breakaway group at the 1km mark which included last year’s silver medallist Uslu of Turkey and Italian hope Nadia Ejjafini. It also included bronze medallist Portugal’s Felix who had denied Britton a place on the podium in a photo-finish last year. After nine minutes of running a group of three, Britton, Felix and Ejjafini had broken away with Uslu dropping back and eventually dropping out. The Wicklow women continued to crank up the pace and moved away from the field at the half way point. Positions were changing behind her with Britain’s Gemma Steel (Great Britain) who had moved progressively through the field taking up second position from Felix. Steel closed the gap on Britton to 20 metres but she never managed to close in on the Irish women. In the closing stages Britton was a confident clear winner with Portugal’s Felix overtaking Steel to win the silver. In the Men’s Senior Race, Joe Sweeney (DSD AC) also produced a gutsy performance to finish fifth overall in a race which was dominated by Atelaw Bekele of Belgium. The Dublin man was in the chasing group throughout the race and in the latter stages moved up to second position before drifting back to fifth. The Men’s team finished sixth overall with Paul Pollock greatly contributing to this with a fine debut performance at these championships finishing 26th. In the U23 Women’s race Sarah Louise Treacy was the best of the rest of the Irish finishing 18th overall her best ever placing yet at these championships. While Una Britton sister to Fionnualla was 38th in her debut run at these championships. In the Men’s U23 race Michael Mulhare who was part of last year’s Gold winning team was unfortunate to be spiked and lose his shoe in the opening 1km. This hampered the Laois man’s performance and he could only manage 31st position after targeting a top 10 finish. Jake Byrne was solid throughout the Men’s Junior race finishing in 23rd place while in the Junior girls the best performance in this young team was Siofra Clerigh Buttner who finished in 49th place. The Irish Team return to Dublin airport tomorrow at 17.05. Irish Senior Men:Team 6th/5th Sweeney, Pollock 26th, Ledwith 35th, Hanrahan 50th & Thornton 54th. Junior Men:Team 12th/ J.Byrne 23rd, S.Tobin 45th, R.Finnegan 65th, K.Dooney in 81st and L.Brady in 96th. Junior Women Team: Team 12th/ S.Clerigh Buttner 49th, C.McCarty 51st , K.Veale 57st, M.Mulhare 71st, M.O’Sullivan 80th.